Kolkata is often referred to as the melting pot of various culture. From time immemorial various communities like Chinese, British, Armenian, Baghdadis and others found their way to this city and settled down under different circumstances for different reasons. Kolkata being a port town and with its proximity to the Silk route cited itself as a favourite settling town for many traders. With time their culture, heritage, customs seeped into the local Bengali lives and gave birth to a diverse and unique cosmopolitan heritage that Kolkata is so proud of today. If the Govt house or the face of Esplanade carries the Neo Baroque style buildings established by the British then the Armenian church of Nazareth speaks volume of its Armenian settlement. Go to Tangra or Tiretti Bazaar and you will see a unique Chinese heritage enter wined with its Local counterparts. Every community that settled foot in this city had something to offer and wanted to preserve their own culture and cuisine. The dishes, ingredients or the cooking techniques that they brought with themselves slowly got amalgamated or got changed to adapt to the local circumstances giving Kolkata a rich and unique culinary heritage. Though its debatable to pinpoint which Community influenced it the most but undoubtedly today's Kolkata carries a long story to tell of its British Raj. Being the political headquarter of British era for almost 2 centuries (late 17th century to 1911 when the capital shifted to Delhi) it not only acquired many new establishments, Huge developments in terms of connectivity or amenities, got liberated with its Renaissance but with time its food heritage got an unique characteristic as well. In the time of British India, Kolkata was regarded as the second city of the British empire after London and for work many Britishers chose to settle down here. The dissimilar circumstances, the extreme weather differences, the unavailability of familiar ingredients or the access to the right equipment could not deter the snobbery of the Britishers who wanted to keep their lifestyle, culture and food heritage intact. So the Memsahibs taught the local cooks the recipes of Pot roasts, soups or puddings and they in turn filtered the recipes through various components and circumstances. While the roasts got a scrumptious stuffing of locally available ingredients the sauces got a distinct flavour of cumin and red onions. The cooks with their local spicy taste buds tried to perk up every dish with Indian spices and techniques. And later with the advent of the Babu culture these recipes got appreciation by the local Jaminders and learned Bengali Govt. employees and slowly yet surely seeped into Bengali cuisine. 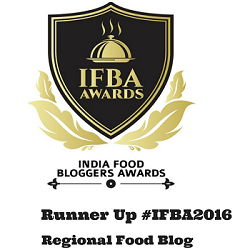 Recently when KPC College of Nutrition announced their yearly fest and invited Kolkata Food bloggers to be the co-organizer, We got an in-depth insight into this matter. The theme this year being ‘Raj Remnance: Laat Saheber Bangali Khansama (The Raj Era: The Bengali chefs to the Britishers)' threw a different light to our everyday cuisine which we though of our own but came after the Britishers. For example who would have thought that the White spongy Rasgullas that Bengalis are known for, were actually given to us by the British. It was fascinating to know how, once while making cheese for the British palette the famous Bandel cheese fallen into a bowl of sugar syrup and later Sweet spongy rasgullas were born. Or how so well known Bengali Mocha’r Ghanto (Banana flower curry) was invented just out of necessity during the Sepoy Mutiny under the British Raj. When we come to think about it, gather and link up stories after stories we can so clearly see a changing time, a saga in history, where not only Bengali food but its culture, its outlook, Its social strata, literature all went through a change. A deep impact that the British brought in and how the whole society whether in the drawing room of the Kolkata aristocrat or a middle class family in the small mufassil town got changed. The evening tea became an integral part and till date most families all over Bengal come together in the late evening for a small yet important break for tea with snacks. Eggs, Chicken, Tomatoes (often known as ‘Biliti begun’ or foreign brinjal) got introduced to a Bengali kitchen and omlettes, poaches (sunny side up cooked on griddle), Dimer Dalna, Tomato chutney in its new avatar became such important part of everyday Bengali diet. It was kind of an eye opener for all of us in the team and we got so hitched to it that started researching more into the age old history of Bengali cuisine. The results were shocking and overwhelming at the same time and has made us so rich and proud with knowledge. 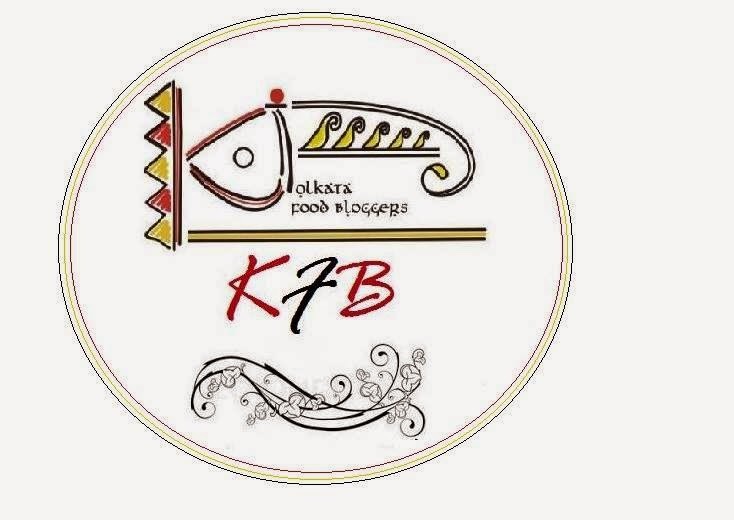 Being a part of this Nutrifest project we all in the KFB group have been recreating few of the unique recipes that has came in to being, evolved and become an intrinsic part of Bengali cuisine. In this post I have tried to recreate the well known Caramel pudding or Caramel custard, the quintessential dessert that served to the reserved palate of Sahibs and Memsahibs of the British era. This dish was an integral part of the famous Dak Bungalow cuisine. Dak bungalows were the inns or houses for travelers on the Dak or Postal system route. On those days the Sahibs often had to travel on the routes for inspection, newer implements etc. Sometimes their wives accompanied them on such tours. Mostly the quaint little places where these dak Bungalows were located were far from any market place. The chowkidars or the Khansamas bought only weekly provisions that too when an officer or a traveler would visit the Bungalow. Such scarcity of ingredients and crunch of time gave birth to the Dak Bunglow food which is Whipped up with fewer locally available ingredients and cooked on very short notice to cater to the comparative bland tastebuds of sahibs and memsahibs. If they arrived late the khansama will whip up a meal with whatever was available. Their go to recipes on such occasions were the famous egg curry or Dimer Dalna, Vegetable soups and baked pudding with milk and eggs from local milkman. He could only cook a wild game bird and make the famous Dak Bungalow chicken curry if the sahib stayed for the next days meal. Butter: to brush the mould. Prepare the remekin or tartlet mould by generously greasing them with melted butter. This is very important if you are using the fluted moulds like the ones I used. Take a heavy bottom saucepan and place the sugar and water for the caramel. Cook it on medium high heat. Do not stir rather try to swirl the liquid to cook it evenly once you see the sugar starting to melt. Keep cooking till you get a light golden brown syrup. My family does not like it dark, so I always cook till I get a golden liquid. Take off from heat and pour in the coffee powder. Mix and evenly distribute this among 6 small tartlet moulds or 4 normal sized ramekins. Now prepare the custard by heating the milk and the condensed milk. Once you see little bubbles start to appear on the sides take off from heat and mix in the coffee powder. Cool it for 3-4 minutes. Beat the eggs lightly and add ¼ cup warm milk to it while continuously whisking the eggs. The idea here is not to let the eggs curdled or cooked. Transfer the egg mix to the milk mixture and whisk properly. Strain the custard and Pour this in the prepared moulds which by now must have set. I like to fill the pots almost to the brim. Lightly tap each mould on your kitchen counter to bring all the bubbles on the surface. Using a spoon take them out, this will result in a shiny glossy custard. Take a big oven safe tray and place one kitchen towel inside. Place the custard filled pots on it. Pour hot water till half of the moulds are submerged in it. Carefully place it in an pre heated oven at 180C. Bake for 15-20 minutes or little more depending on the size of the bowls used. Once done the custards would be set on the sides but little ziggly in the center. Carefully remove the pan and cool the custard pots on wire rack. once they come to room temperature chill them in the fridge over night or min for 5-6 hours. Take a big Aluminium bowl and set the caramel and then pour the custard in it as mentioned above. Take a big pressure cooker in which the bowl will fit. Cover with foil. Place a perforated metal plate (available with the pressure cooker) and pour hot water in it so that it reaches half of your metal container.Place the bowl in it and steam for 25-30 minutes without the weight. Remove the lid, take out the bowl, bring to room temparature and cool as mentioned above. Either use a bigger bowl or smaller moulds and cover with aluminium foil. Take a flat pan or Kadhai. Take a kitchen towel, fold and place on the bottom of the pan. Pour warm water. place the bowls and cover tightly with a lid. steam for 20-25 minutes or till done. Make sure you add enough water to sustain the whole cooing time. To de-mould dip the mould in warm water for a couple of seconds and carefully invert on a plate. Or you can just run a small sharp knife around he edges to loosen it from its sides. Here the greasing part comes in handy. only this single piece in the picture gave the desired result of intact shape (the back is little damaged and I had to coax it with a knife to come off perfectly. ) but the best part is its deliciously creamy and yummy texture. 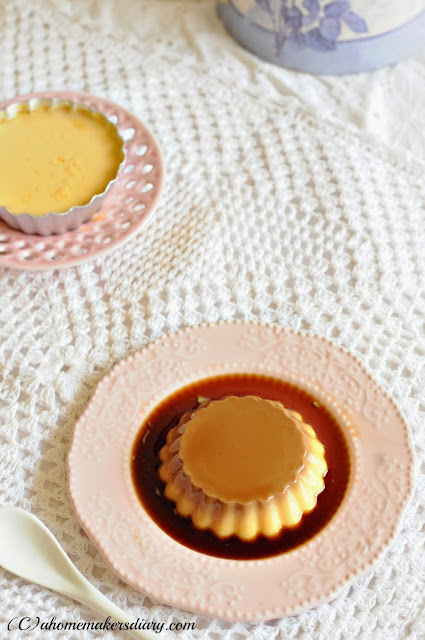 Love the addition of coffee to this classic caramel custard. This is one of my favorite dessert of all time. 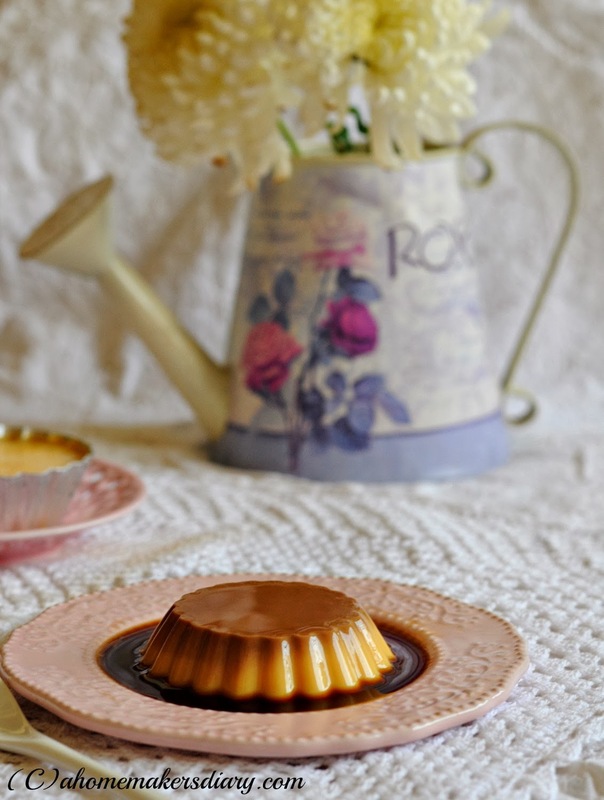 The custard look fabulous and you've used a different method too. Will try this for sure. Lovely shots! 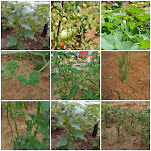 Looks so beautiful.. great clicks too!! 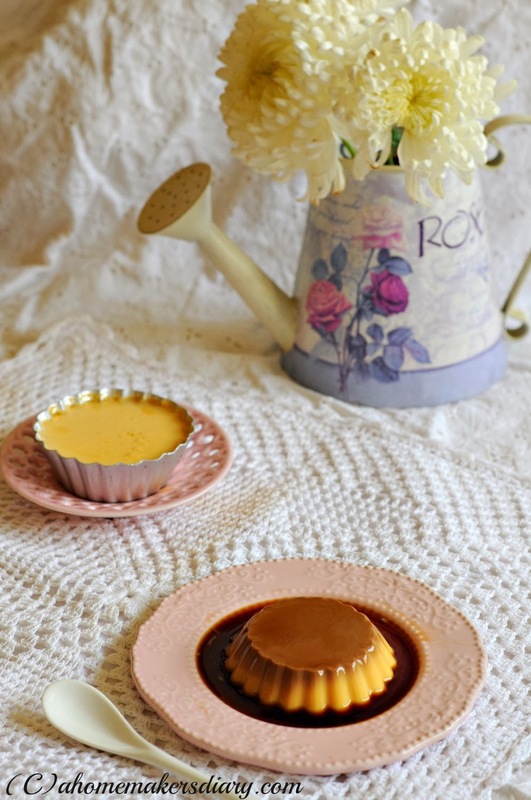 Flan looks fabulous and it has perfectly. Can I prepare this in a simple microwave oven? Mine doesnt have the grill or combination mode. Can I try this recipe in a simple microwave oven? Mine doesnt have the grill or the combination mode! 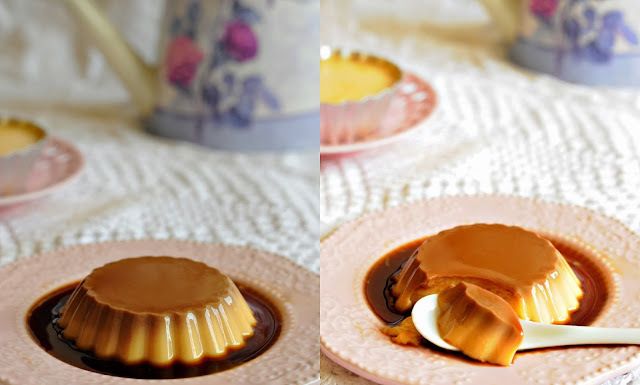 Gorgeous clicks, love the idea of caramel and coffee together. 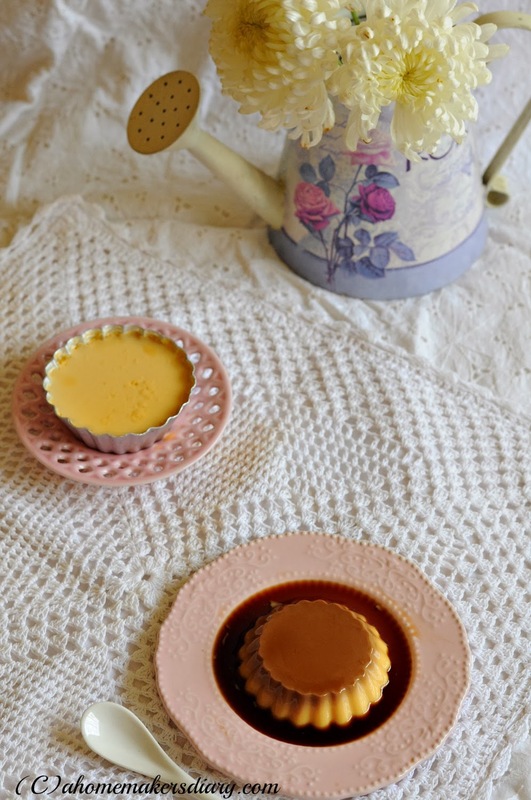 Brilliant post, such interesting facts and details.. and that caramel custard looks just perfect ! @Debjani, am not sure if you could bake these in normal Microwave. I never tried so cannot tell. I just have updated the post with the stove top and pressure cooker method the way my mother always does. please check. perfectly set caramel custard. looks too good.